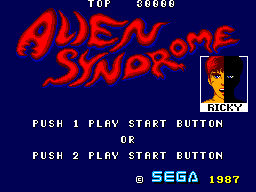 Alien Syndrome was released in all major markets for the SMS. The Japanese version is the only one with different artwork. "Sega's super arcade hit comes to life... on your Sega System! A Mysterious alien space fleet has invaded human occupied space. 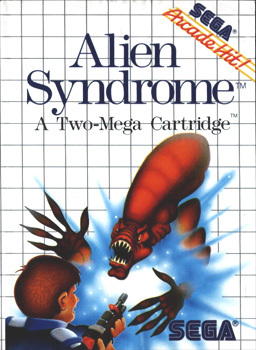 Called the Alien Syndrome, they are the deadliest creatures mankind has ever encountered. The Alien Syndrome shoots first... and asks no questions! 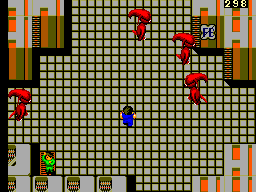 A battalion of your friends attacks the alien fleet. But they are captured and held hostage. Earth command sends one soldier to get them back... You! You're Ricky, Earth Command Trooper. When it comes to deep space combat, you are the best. Armed with only a combat rifle, you must infiltrate each ship, rescue the hostages and escape... Before a time bomb vaporizes the ship into cosmic debris. The odds... and the clock... are against you. The aliens can appear anywhere... At any time. So shoot fast and straight. The hostages are depending on you!" Collect the question mark boxes from the ships when the counter reads 272, 267, 232, 222, 171, 161, 131, or 121. When you do this, you will be invincible for a short period of time. Level maps (by PickMeUp) in .ZIP format. 596kb in size. Save States (for MEKA) by Oli & Rey in .ZIP format. 22kb in size. 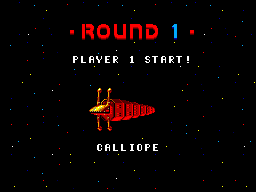 Information about the original arcade version at KLOV.